Corn Queso Dip is the perfect dip for your next Mexican fiesta or tailgating party. It’s deliciously rich & creamy with a hint of spice and delicious corn flavor. Rick & I recently had an extremely weird experience with queso. It all begins with Rick’s car being stolen. I woke up one morning, looked out the window and said, “Rick, where’s your car?” His Subaru seriously disappeared from out in front of our house. We were even sleeping with the windows open and didn’t hear a thing. Fast forward about a month later, when we’d given up all hopes of seeing the “Subs” again, and we got a call from the police. His car was found in Washington, at the bottom of a ravine. There was not much damage, except for a small dent on the driver’s side. Really the only thing that was out of place was that there was a jar of queso in the passenger’s seat. We got the car back and a jar of queso. Fast forward about a year later. I now think we’ve gotten over this incidence and are ready to test the waters with queso again. In this queso recipe, I’m taking it about as far from the jarred neon-orange queso as you can get. 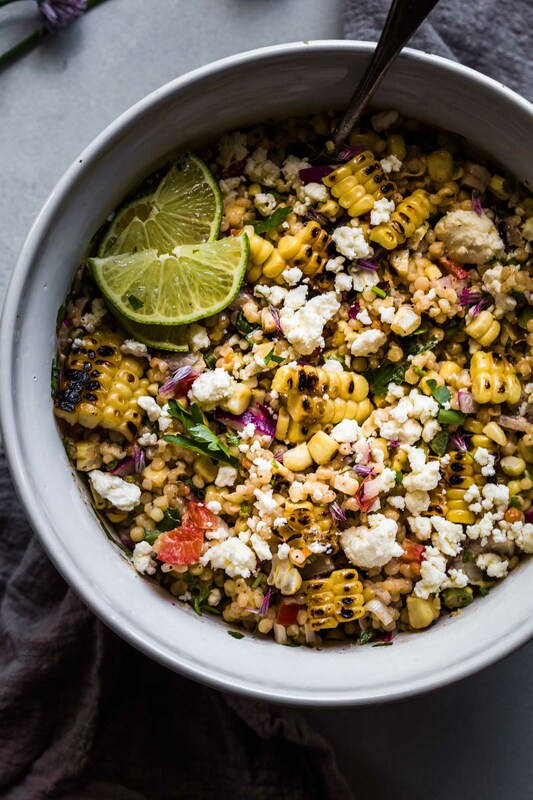 Instead, I’m really amping up the flavor by adding in lots of deliciously creamy & flavorful corn and topping it all off with fresh radishes, cilantro, and jalapenos. To make this queso dip extra creamy, and to give it that amazing corn flavor, I made a corn puree and added that into the mixture. Then, I also stirred in some whole corn kernels. 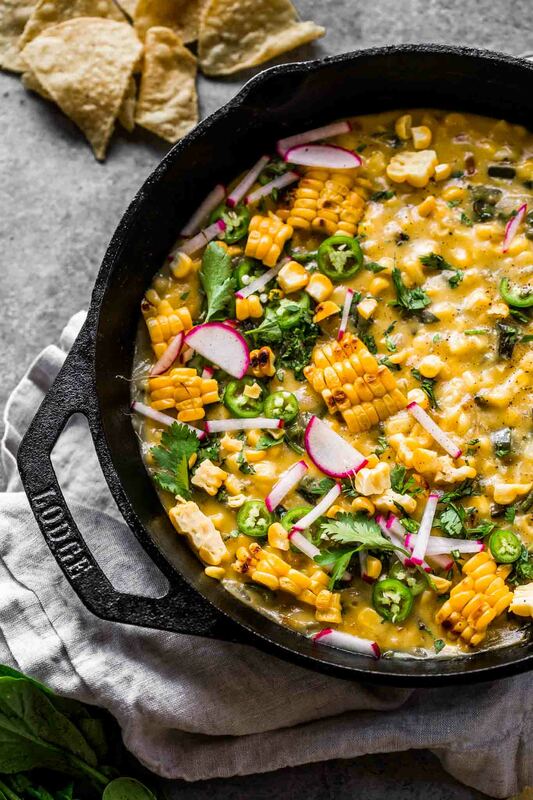 You’ll notice in these pictures, there is some charred corn topping the queso. 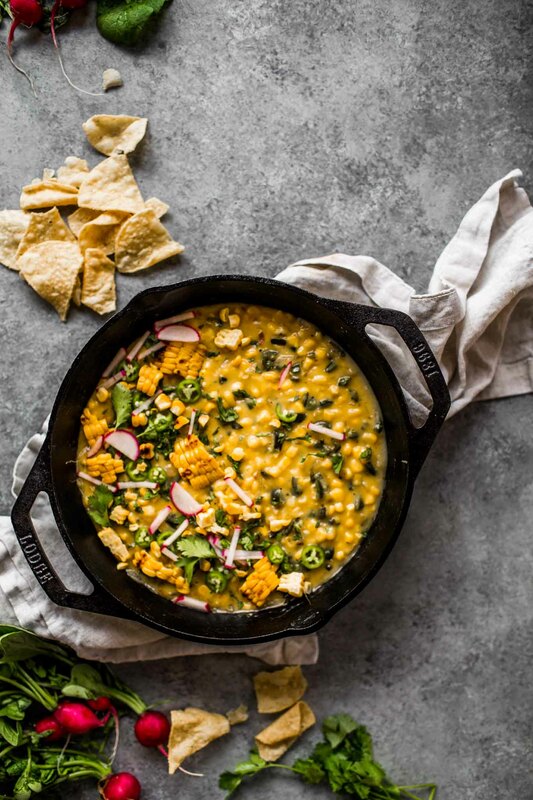 I had some leftover from making this Mexican Street Corn Salad, so I went ahead and topped this queso dip with those charred pieces too. If you like things spicy, by all means load up on the jalapenos and top your queso with plenty of those. But if you like things milder, you can leave them off entirely. I also topped my queso dip with radishes (for extra color and crunch) and some cilantro. To make things even more delicious (and a bit more healthy), I make a batch of these Baked Tortilla Chips to serve alongside. Also, if you’re looking for a dairy-free or vegan queso dip, I’ve had great success using Chao Slices in place of the cheddar cheese. They melt just like regular cheese and have a delicious, creamy texture. I hope you love this queso dip as much as we did! It’s perfect for tailgating parties or Mexican fiestas. 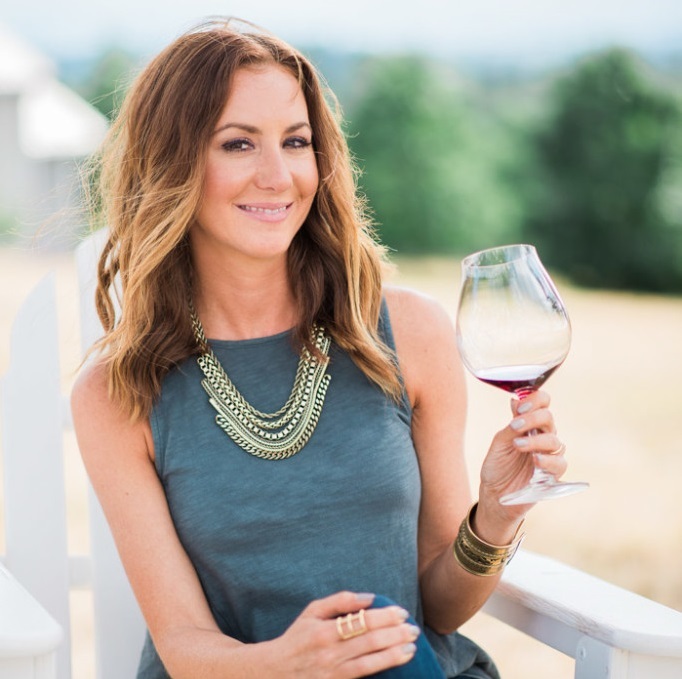 I’ve got some great wine pairings below, or you could serve it up with some of my favorite margaritas. In a blender, puree half of the corn with 1 cup of water until smooth. In a cast-iron skillet, heat the olive oil. Add the poblano, onion and remaining corn and cook over medium-high heat, until onions are softened, 8-10 minutes. Add corn puree and cook, stirring, until bubbling, about 2 minutes. Add the Chao and cook over low heat, stirring, until melted. Season with salt and pepper and garnish with cilantro, radish and jalapeño. Serve hot, with tortilla chips. 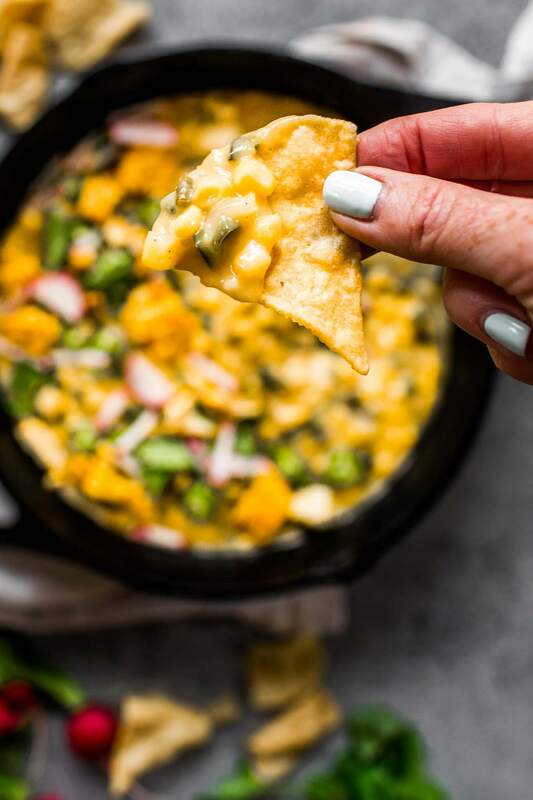 If you'd like to make this queso dairy-free, I recommend substituting the cheddar cheese for Creamy Original Chao Slices (look for them in the produce section). If you loved this Queso Dip recipe I would appreciate it so much if you would give it a star review! Also, be sure to snap a picture of your finished dish and share it with me on Instagram using the hashtag #platingsandpairings. Sparking Wine – Try a budget-friendly cava or prosecco with this queso. The combination of the creamy dip and salty tortilla chips are amazing together. Rosé – The acidity in rosé is perfect with this rich, creamy queso dip. this looks insanely delicious Erin!! I love queso but I reckon you’re homemade would be SO much better than jar! It was so yummy Georgie! 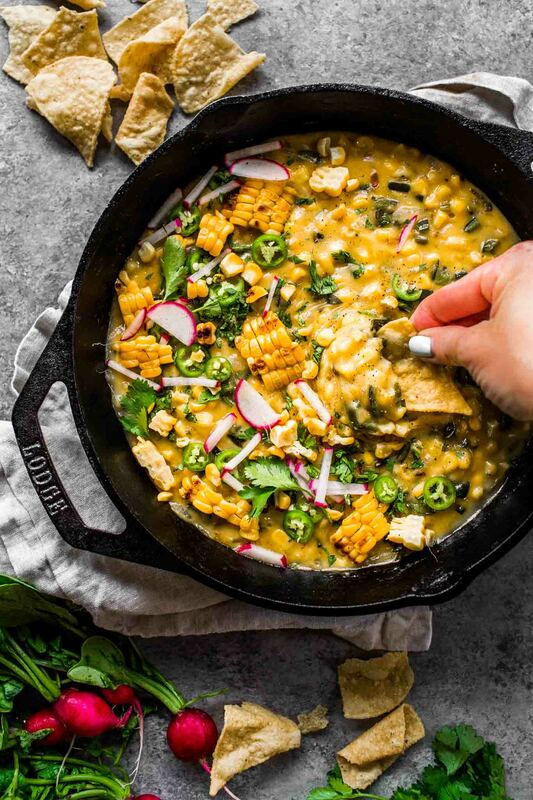 I love any excuse to eat queso right out of the pan. Hi Julie – Yes, it should reheat well. All you have to say is poblanos and cheddar and I am in! This corn queso dip looks absolutely scrumptious and perfect for a Mexican fiesta or just a really good Friday night! I’m all for this queso dip and a bottle of bubbles any night! I don’t know what I love more, the story of the queso found in the stolen car, or this dip! It sounds so awesome!! I’m 100% saving this recipe to make with my kids using your dairy free recommendation. The dairy free version really was so good Mary!!! I think I like the looks of this recipe better than the recipe. 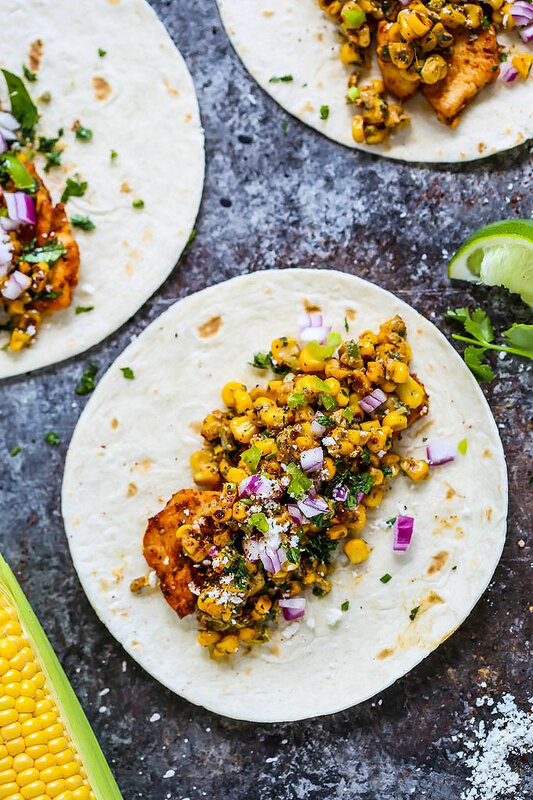 How did you get frozen corn kernels to get those grill marks? No less hold together as they are. Could you please rewrite the recipe? Its less greasy than Mexican style.